Pamela Downe is an Associate Professor of Anthropology in the Department of Archaeology and Anthropology. 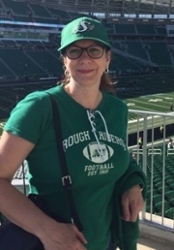 Pam received her doctorate from York University and joined the University of Saskatchewan in 1994 as a faculty member in Women’s & Gender Studies. She transferred to the Department of Archaeology & Anthropology in 2008 and served as Department Head 2010-2015. As a medical anthropologist, Pam’s primary research interests lie in the cultural dimensions of, and community responses to infectious disease and maternal care. Her research projects focus on: (1) motherhood and mothering in the context of HIV/AIDS; (2) cultural safety and maternal care; (3) the cultural bases of reproductive decision making; and (4) pain and wellbeing. Downe, Pamela J., Sharbach, J., & Waldram, J.B. (In Press). Experiences of disaster and “maternal risk” amidst forest fire evacuation in northern Saskatchewan. Journal of Mother Studies. Downe, Pamela. (2017). Force fields of motherhood and maternal affinity. Journal of the Motherhood Initiative for Research and Community Involvement, 8(1/2), 145-157. Brittain, D.R., Gyurcsik, N.C., Tupper, S.M., & Downe, P.J. (Accepted). Moving forward with physical activity: Self-management of chronic pain among women. Women’s Health Issues, 28(2), 113-116. Babineau, C., McMullen, L., & Downe, P.J. (In Press). Negotiating what constitutes depression: Focus group conversation in response to viewing direct-to-consumer advertisements for antidepressants. Canadian Journal of Communication. Hatala, A., Erickson, L., Isbister-Bear, O., Calvez, S., Bird-Naytowhow, K., Pearl, T., Wahpaiw, O., Engler-Stringer, R., & Downe, P.J. (In Press). The inter-personal skills of community-engaged scholarship. Journal of Engaged and Community Scholarship. Downe, P.J. (2017). “Bad mothers” in the HIV/AIDS epidemic in Canada. In M. Hughes Miller, T. Hager, & R. Bromwich (eds. ), “Bad Mothers”: Representations, Regulations, and Resistance (pp. 103-120). Toronto, ON: Demeter Press. Downe, P.J. & Dravland, R. (eds.). (2016). AIDS Saskatoon: A history of Service, Hope, and Engagement. Saskatoon: AnthroInSight. vi. Antony, W., Balfour, G., Biggs, C.L., Brooks, C., Downe, P., et al. (eds.). (2016). Gender, race, and Canadian law. Halifax: Fernwood Publishing. Williamson L.E.A., Lawson K.L., Downe P.J., & Pierson R.A. (2014). Informed reproductive decision-making: The impact of providing fertility information on fertility knowledge and intentions to delay childbearing. Journal of Obstetrics and Gynaecology Canada, 36, 400-405. Downe, P. J. (2014). Intersecting sites of violence in the lives of Aboriginal girls. In H. Berman & Y. Jiwani (Eds. ), Faces of Violence in the Lives of Girls (pp.25-40). London, ON: Althouse Press. Biggs, C.L., Gingell, S. & Downe, P.J. (Eds.). (2012). Gendered intersections: An introduction to women’s & gender studies. 2nd Edition. Halifax: Fernwood Publishing. Downe, P. J. (2011a). Feminist anthropology anew: Motherhood and HIV/AIDS as sites of action. Anthropology in Action, 18(1), 5-15. Downe, P. J. (2011b). Motherhood and maternal care: Anthropological perspectives. In The Motherhood Initiative for Research and Community Involvement (Ed. ), Teaching motherhood: A collection of reflections on post-secondary pedagogical approaches to courses on mothering/motherhood (pp. 63-66). Toronto: Demeter Press. Whitaker, R. & Downe, P.J. (2011). Feminist anthropology confronts disengagement. Anthropology in Action, 18(1), 2-4.